Product prices and availability are accurate as of 2019-04-14 11:47:03 UTC and are subject to change. Any price and availability information displayed on http://www.amazon.com/ at the time of purchase will apply to the purchase of this product. For top quality products for all your painting and decorating needs, look to the Dynamic brand. With more than 30 years in the business, we deliver the best selection of products for do-it-yourselfers and professionals. Our dedication and commitment to quality and innovation means you always get the very best from Dynamic. 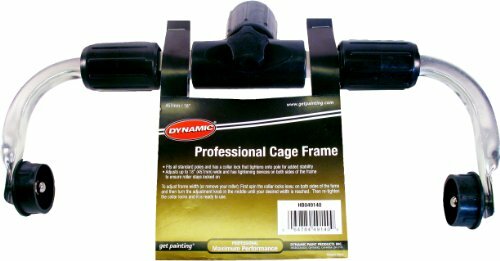 Dynamic Adjustable Professional Roller Frames fit all standard poles and have a collar lock that tightens onto the pole for added stability. Each frame adjusts up to 18 inches in width to accommodate most paint rollers. They have tightening devices on both sides of the frame to ensure the roller stays locked during use. Dynamic paint products set the industry standard with an extensive assortment of painting tools and accessories. Whatever painting or decorating project you're planning, count on Dynamic brand paintware - and get painting!